CROWDS OF CHICAGOANS gathered outside a Sears store window. Behind the glass, a mechanical TV set displayed the first pictures from Chicago station W9XAP. The station inaugurated its television service on the evening of August 27, 1930. W9XAP's mechanical television equipment painted grayscale pictures with a mere 45 lines. On the tiny screens of 1930, this amount of detail could effectively portray closeups. In fact, viewers could easily recognize performers' faces. People compared the pictures to newspaper photos. INTERLACING. The scanning rate was only 15 pictures per second. By comparison, today's TV sets scan at 30 or more frames per second. Sanabria's ace in the hole was his patented scanning disc. This unique disc interlaced each picture frame three times. Despite the low scanning rate, the disc eliminated much of the flicker between frames. PUBLISHED SCHEDULE. After about a year, W9XAP broadcast according to a regular schedule. Programming included news and entertainment fare, such as live music, drama and comedy shows. From the start, program listings appeared in the Chicago Daily News. AM radio station WMAQ provided coordinated television sound as well as performers. W9XAP STUDIOS occupied the 25th floor of the landmark Chicago Daily News building. Today, we know this location as 2 North Riverside Plaza. The famous, Art Deco building still stands on Chicago’s northwest side, blocks from Chicago’s Loop. Chicagoans are most familiar with this edifice. A bridge over Canal Street connects it to the Metra train terminal. Commuters pass through the building and exit where Madison Street crosses the Chicago River. SISTER STATION. W9XAP / WMAQ had a Chicago sister station in W9XAO / WIBO. WIBO provided W9XAO's sound. W9XAO / WIBO started transmitting television in 1930. 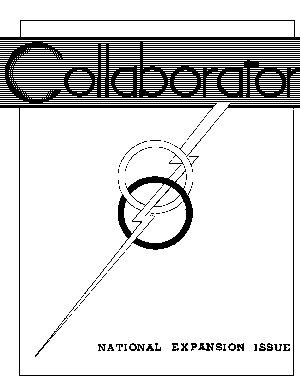 By 1931, the cooperative stations were providing three hours of programming daily. A building on Chicago's north side housed W9XAO’s studios. Unfortunately, W9XAO's 6312 North Broadway home is gone today. It once stood a few doors south of Devon Avenue, near the Loyola University campus. SANABRIA. Both W9XAP and W9XAO owe their technology to Chicago television inventor Ulises A. Sanabria. Sanabria began public, experimental telecasts on June 19, 1928. Chicago AM radio station WCFL sent the pictures aloft. Meanwhile, station WIBO carried the accompanying sound. The WCFL television transmitter was an ex-Navy circuit that occupied the north tower of Navy Pier. The station antenna spanned the space between the two towers. Sanabria's historic program probably also rode high into the night sky and bounced off the ionosphere: WCFL's experimental shortwave outlet W9XAA may have simulcast the show. The signal may have landed hundreds of miles away, as shortwave telecasts often did. In those days, ham radio operators built their own television receivers. Some might have received the Navy Pier signal. SEQUENTIAL VS. INTERLACED. These earliest Chicago television pictures used 48 lines. The scanning was sequential, rather than interlaced. Only a year later, Sanabria patented his interlaced, 45-line system. This interlaced system was what Western Television used so effectively at W9XAO and W9XAP. Interlacing eliminated much of television's annoying flicker. At last mechanical television became pleasant to watch! For this reason the NTSC eventually adopted interlaced pictures for all US television. Other worldwide systems such as SECAM and PAL also employ interlacing. WHIZ KID. Sanabria, an Oak Park native, conceived of television as a high school freshman. Sanabria's television epiphany occurred about the same time as Philo Farnsworth's. Some four years later, Sanabria demonstrated his working television system. Bill Parker was the engineer who built much of W9XAO and W9XAP. Bill's reminiscences trace Sanabria's television invention back to October, 1925. CLEMENT WADE. Sanabria became the technology lead behind Clement Wade's Western Television Corporation. Western opened shop in Louisville, Kentucky. The company operated out of a Reynolds Metals building. (Today, Reynolds is part of Alcoa.) Western President Clement Wade had earned his fortune with Eskimo Pies, then a Reynolds subsidiary. Wade's intent was to market a television system for displaying stock market results. The product would have been sort of a video stock ticker. Apparently Western Union threatened legal action. Thereafter, Western Television moved to Chicago and attempted to commercialize television as an entertainment medium. Sanabria's interlaced scanning disc. From his U.S. patent #1,805,848 (1929 application). ECHOPHONE. Soon thereafter, Western Television acquired Echophone, and manufactured mechanical television sets at Echophone's Waukegan, Illinois plant. The two most famous models are the Visionette and the Model 41. 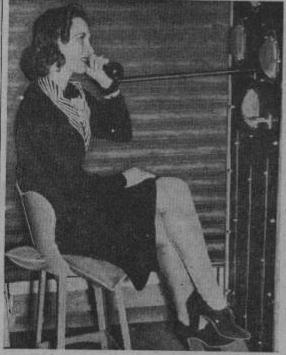 With the Visionette in 1929, Western launched an industry. The Visonette was the first commercial television receiver. The much improved Model 41 came out in 1932. Both models displayed orange-red pictures from their neon kine tubes. For a black-and-white TV, the lamp color might seem strange. Yet neon orange-red imparts very natural flesh tones for all races. THE VISIONETTE contains a 17-inch aperture disc that builds a three-inch picture. (The largest picture available from the neon tube inside is about 1.5 inches. A lens enlarges the image, but also narrows the angle of view. Only one person can comfortably watch.) The set contains no electronics. A plug at the rear of the Visonette scanner allows connection to a shortwave (picture) receiver. THE MODEL 41 uses a crater tube and an eight-inch lens disc. The set provides bright, 4.5-inch pictures for more than one viewer. The picture receiver is an eight-tube superhet. The set has no sound receiver, but any AM (MW) radio will do. EMPIRE STATE. A limited release Western TV, the Empire State, uses a similar chassis. Yet the image size is 8 inches. Again, the secret is Lloyd Garner's splendid hot-cathode crater tube. The Empire State includes two receivers, a shortwave set for the picture and an medium-wave (AM) set for sound. In all the sets, a special knob allows the viewer to adjust the picture framing, a particular problem with mechanical TV. The knob actually turns the motor field. DEPRESSION. Unfortunately, the Great Depression made these elegant sets a luxury purchase. Precious few could afford a Western set. Fortunately, many stores and bars bought sets, and entertained customers with the early TV programs. For venturesome, but less well-heeled souls, Western Television sold a TV scanner kit for $59.50. The scanner kit would connect to a shortwave radio that could pick up the police and TV band. Most people couldn't afford the kits, either. Besides, product promotion was difficult. The Federal Radio commission (predecessor of the FCC) prevented television broadcasters from advertising their products. In fact, The FRC then prohibited any form of TV advertising. NBC BOUGHT W9XAP from the Chicago Daily News. The station established NBC television in Chicago. For this reason, we might think of W9XAP as the ancestor of WMAQ TV. Yet with NBC's commitment to electronic television, the mechanical W9XAP had no future. It faded forever to black in March, 1933. Two years earlier, NBC had purchased and shut down another Chicago mechanical station, W9XR. W9XR had been the first television outlet of WENR, a predecessor of today's WLS-TV. After W9XAP's shutdown, the W9XAO and WIBO venture briefly became Chicago's only television broadcaster. Yet in May 1933, the FCC withdrew WIBO's license. Struck dumb, W9XAO ceased operation. WESTERN TELEVISION'S FATE. Some of W9XAP's other sister stations fared much better. W9XD, the Milwaukee Journal station in Milwaukee, Wisconsin, remained on the air until 1938. After a conversion to electronic equipment, it became WTMJ. Kansas City, Missouri station W9XAL converted from shortwave to VHF operation in 1935. A few years later, the station installed electronic television equipment. 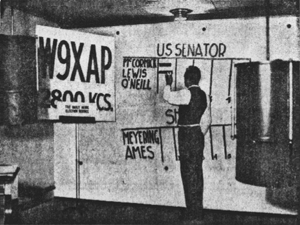 Educational TV pioneer W9XK, operated by University of Iowa, continued telecasts until 1939. Still, with only a dwindling market for Western's receivers, Clem Wade sold Echophone to Hallicrafters. Lloyd Garner, Armando Conto and Bill Parker then formed Western Television Research. This outfit built displays for Chicago's Century of Progress exhibition. Separately, U.A. Sanabria and Mel Hayes displayed a theatrical projection system based on mechanical TV. AMERICAN TELEVISION. Later, Sanabria founded American Television Institute (ATI) and de Forest-Sanabria Television. American Television opened in 1934. For some 40 years, the school educated television technicians. During World War II, American trained Signal Corps personnel. The lessons included radar. The school also manufactured radar CRTs for the government. Throughout the 1950s, de Forest-Sanabria manufactured electronic TV sets and sold them to consumers. In the 1970s, Coyne Institute purchased ATI. Afterward, the merged school became Coyne American Institute, now Coyne College. TV STANDARDS. The clarity of W9XAP's telecasts proved the superiority of Sanabria's patented, interlaced scanning method. This method eliminated the flicker produced by competing systems from John Baird and Charles Jenkins. W9XAP's picture also provided twice the detail of Baird's pictures. Eventually, 24 stations adopted Sanabria's Western Television technology. Today, all major world television systems employ interlaced scanning. TOURING SHOWS. Sanabria's projection television and picturephone demonstrations toured this country and Canada. The projection shows often took place at the B.S. Moss Broadway Theater in New York. In 1932, British television journalist Alfred Dinsdale witnessed one of these projection shows. Dinsdale wrote that the projected television images were “better than anything I'd ever seen.” (See First Principles of Television, p. viii.) Eventually Sanabria's projection pictures reached 30 feet across. The ultra-bright television lamp for these pictures was the spectacular Taylor tube, probably a Sanabria exclusive. The Taylor tube is a water-cooled, hot-cathode arc lamp. HIGH TECH. Sanabria and his associates experimented with methods of lineless, infrared, 3-D and color TV. As a Sanabria employee, Lee de Forest patented a system of field-sequential color TV. Sanabria also invented and tested a system of cable TV with 150-line pictures. In this system, all electronics reside at the TV studio. Only the scanner is in the home. The pictures have a ten-to-one interlace. In 1938, Sanabria's Collaborator journal (an ATI publication) included his description of a new weapon. This weapon is the “Television Torpedo,” a television-guided cruise missile. A wire antenna across its twin tales receives control signals from the mother plane. An iconoscope tube in the nose of the missile allows the remote pilot to spot the target. In World War II, RCA actually manufactured such a missile for the US Army. 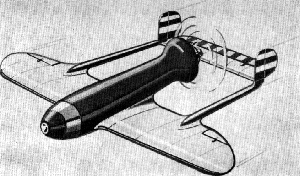 At the time when Sanabria published, the Television Torpedo was already a proven technology. AMERICAN TELEVISION became the largest private school in the country. At its peak, the school enrolled 6,000 students in a four-year B.S. program. Unlike many technical schools, ATI offered residency. Campus locations included Chicago, Detroit and Los Angeles. The Pearl Harbor bombings upstaged the opening of a New York campus. NTSC. Sanabria and his brother John served on the National Television System Committee (NTSC). This committee designed the analog television standard that served the United States for the next 60 years. A digital standard replaced NTSC in 2009. FINAL DAYS. De Forest-Sanabria Television manufactured its last sets in 1961. For the last several years of his life, Sanabria lived with his family in Wilmette, Illinois. Wilmette is a northern Chicago suburb. The home was a short walk from Loyola Academy and New Trier-West High School. For a brief time after the Wilmette days, the family resided in a Northbrook home. U.A. 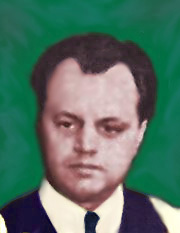 Sanabria died in 1969. He was 62. The family held a memorial service at Wilmette's Trinity Methodist Church, 1024 Lake Avenue. Reverend Burton G. Randle officiated. Copyright © 2004, 2005 by James T. Hawes. All rights reserved.